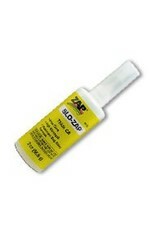 Cyanoacrlyate adhesive. Very high viscosity formula. Super thick and super strong. Thick and strong for high-stress areas. Works well on hard woods such as Maple and Oak. In modeling its ideal for laminating wood parts and forming fillets. Because its thick, it will not run, it forms a very clean even fillet around all types of joints. The high cured strength means it works great on higher stress areas. Allows 30 seconds for positioning and cures in 60 seconds or less. 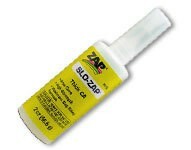 To accelerate cure time use Zip Kicker. Works best on: Aluminum, Forming Fillets, Laminate, Metal, Most Plastics, Rubber and Wood.